PLYMOUTH Albion prop Dan Pullinger believes he has improved this season, despite having spent a large part of the campaign on the replacements’ bench due to the form of Christian Judge and Ollie Dawe. Pullinger, still only 21, has made six starts, but has been on the bench 14 times. However, he believes the competition he has had with Judge and Dawe has brought the best out of him. He started Albion’s last game against Blackheath and won the sponsor’s man of the match award. However, there was no fluke about the Blackheath one as Albion’s scrum dominated Blackheath. 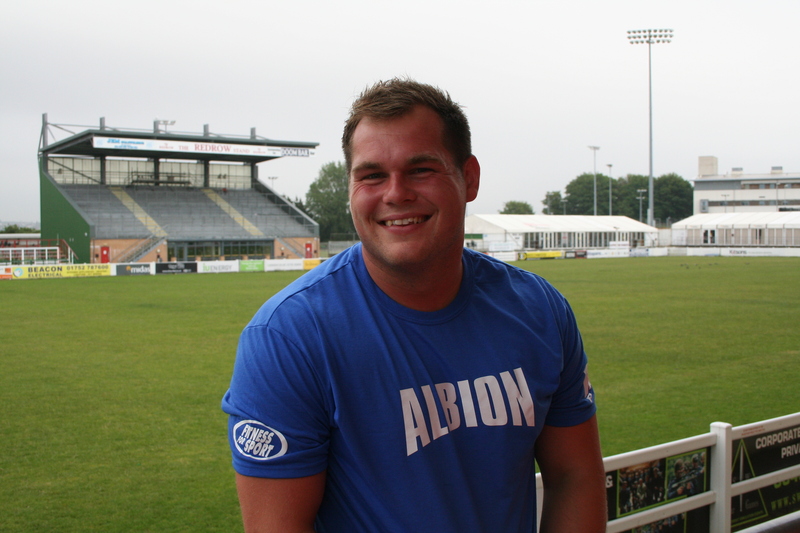 Plymouth-born Pullinger, whose first Albion league start came in the final match of last season, has enjoyed the front-row battle in 2015/16. “It is good to have competition as it does make you a better player because you are trying to work as hard as you can in training and once you get some game-time you want to try and keep the shirt,” he said. “I have had to be patient but I have been biding my time. I had a good game against Hartpury and then had a run against Cinderford and Henley and then Blackheath at home. Pullinger, traditionally a tight-head, has also shown his versatility this year by playing both sides of the scrum. “I don’t mind wearing the loose-head shirt, if it gets me on the pitch,” he said. “I prefer tight-head, but I am coming to grips with loose-head now. It is good if you can play both sides. It gives you more knowledge then anything. If you play loose-head when you are actually a tight-head you know what your opponent is trying to do. Albion’s scrum has been key to their rise up the National One table. They sit third with five games to go. Pullinger is hoping he can keep his place to face Ampthill this weekend. The Bedfordshire club can boost four South Sea Island internationals in their pack. “It will be good to play at Ampthill,” said Pullinger. “I played them once before with Exmouth.